Any excuse for a pie and we’re there. Meat, cream, fruit…you name it, we’re interested. 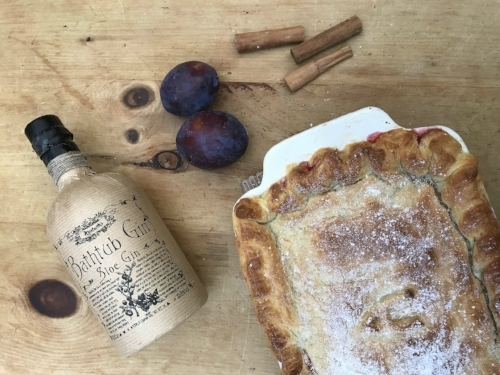 Which is why, for this week’s The Great British Bake Off’s Pastry Week challenge, we’ve created this autumnal treat - a pie filled with all things delicious, including our Sloe Gin. We opted to use ready-made pastry because…well, less time making = an earlier time to eat and enjoy. But of course, if you’re looking for a Paul Hollywood handshake you might want to attempt your own. Either way, it’s what’s inside that really counts, which in this instance is fresh apples, juicy plums and some of our super Sloe Gin. Yum. Read on for how to make this tasty treat - we recommend serving on a crisp sunny Sunday afternoon after a roast and before board games. Add diced apples and plums, cinnamon, flour and caster sugar to a wide frying pan. Soften the fruit on a medium heat for 10 minutes until the fruit juices have released and started to thicken. Remove from the heat and stir in sloe gin - delish. Preheat oven to 200’C (180’C fan oven). Add the fruit filling into a deep pie dish and brush the edges with egg white. Lightly flour a surface and roll out pastry to desired fit, around 1/2cm thick. Lift pastry and rest over the fruit filling, sealing the edges and trimming the excess. Make yourself a pretty decoration using any spare pastry bits. Brush the whole pie with frothy egg white. Scatter a teaspoon of granulated sugar and bake for 20 minutes or until the pastry is puffy and golden. Then lay on the custard and enjoy!